A new story of friendship. That’s sure to be a classic. It may be my go-to gift book of 2012. I’ve been waiting, waiting ever since I first heard about this book over a year ago, and now it’s almost here! The idea is brilliant, and the art looks oh-so delightful. 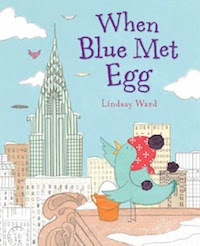 Congrats to Ms. Ward and to Blue, whose sunny outlook I already adore. I think I will hug her and squeeze her and call her George. You're welcome, Catherine. Happy Holidays to you and yours!